Your Guide to Table Planning! If you’re in the process of planning a wedding and you want to opt for the traditional three course meal follow our helpful tips to make sure the seating plan goes to plan! Don’t do this on the hoof. Make sure you and your partner dedicate enough time to this; you don’t want to be doing this a week or so before. 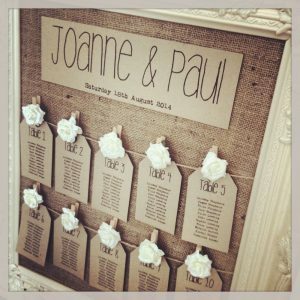 Draw out the table plan with names and colour code each family so it’s clear. It’s important that you’re both involved in this process. There’s nothing worse than your guests panicking about where they’re seating so have a clear table plan up and make name tags to ensure people get seated as quickly as possible. Staff at your venue can also help with this. Don’t leave anybody out as this will not please people! Have a run through if needs be before the actual reception and check the spelling of people’s names. You can have fun making the table plan look tip top, too! It’s always good to mix up the families, friends and age groups (at weddings the most unlikely contenders can turn out to become the best of friends) but if you know there are family feuds then make sure you don’t seat these members together! To break the ice before people start eating (after the starter is a good time) hold a quiz about you, the happy couple. This will get guests talking and interacting and will help make sure that nobody is left out. If you don’t fancy that then hire a magician or make funny table favours who will go around the tables and will get people chatting. If you choose to have a top table make sure it’s not too far away from everyone else so guests can see and hear the speeches and the speakers don’t have to shout to be heard! On your wedding invitations make sure you ask guests for food intolerances, allergies or whether they’re vegetarians. Inform as soon as you can and we’ll make sure all your guests will be as content as they should be. You’re always going to get last minute drop-outs and you have to allow for life taking over but if you’ve gone with a sit down meal option this will be pricier than canapes or buffet food if people don’t turn up. Make it clear on the invitations that you need the RSVP by a certain date and make a spreadsheet with people’s details and answer on so you can chase any stragglers who haven’t come back to you.